Ross Murdoch celebrates being crowned Commonwealth Champion. Photo by Ian MacNicol. This time last year the nation cheered on their heroes at the Glasgow 2014 Commonwealth Games and for students competing from the University of Stirling, the memories remain as vivid as ever. The opening ceremony at Celtic Park on 23 July 2014 heralded the start of 11 days of competition across the City. 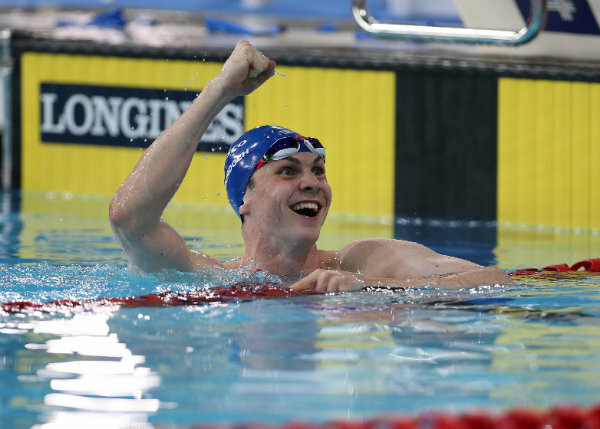 No fewer than 24 students and alumni from Scotland’s University for Sporting Excellence represented their countries with distinction, including 200m Breaststroke Commonwealth Champion Ross Murdoch. “I never actually got to the opening ceremony as I was competing the next day, but I couldn’t sleep as I was so excited about racing so I watched it on TV in the Athlete’s Village,” explained Ross, studying Sport & Exercise Science. “Overwhelming is definitely the word which describes my experience, yet one word doesn’t do it justice. Everyone was so welcoming and so supportive. It was a really great time and Glasgow was fantastic with great weather and such friendly people. “I had imagined that moment of winning the Gold medal millions of times over the two years leading into the Games. I thought about it every day in training and focused everything I could on making it a reality. Slowly but surely I began to believe it could happen and the reality was incredible, especially for it to happen on 24 July, on my Grandad’s birthday. The University hosted the official Team Scotland Preparation Camp which provided a home-from-home for MSc Sports Coaching student Natalie Milne, who trains on campus every day. Natalie competed in the Triathlon Mixed Team Relay at Strathclyde Country Park alongside fellow 2015 BSc Mathematics graduate Marc Austin and current Mathematics student Grant Sheldon. She said: “I enjoyed it all, from the Preparation Camp at the University to the race itself at Strathclyde Country Park. My proudest moment was when they announced the members of each team to the crowds one-by-one – the roar for Team Scotland was incredible. Find out more about the University and the Glasgow 2014 Commonwealth Games.